With the new XCOM game around the corner, it’s time to reflect on the fallen. The First and Second Alien Wars had horrific death tolls. Tens, hundreds, thousands of little pixel-dudes rotated on the spot to face the player, screamed, and fell down to never rise again. Always those brave men and women turned to face the player. We looked them in the tiny pixel-eye as they expired. It was the least we owed them. Heroes, every one. The First Alien War is UFO: Enemy Unknown, aka X-COM: UFO Defence for the non-Europeans. The Second War is known by the codename Terror from the Deep. The Third Alien War, dubbed Apocalypse, will not feature here as I sat that one out. One Skyranger, one X-COM operative, and a lot of corpses. Which idiot let the redneck psi-weakling get hold of a grenade?! Ok, not really. Landing is always safe. I’m sure if it were possible to crash-land, then the Skyranger would do that at least twice per game. Getting out of the shuttle. Your parents were right – it’s not safe to be out on the streets after 9PM. Aliens can see in the dark. X-COM operatives can’t. If you’re not wasting time units lobbing flares everywhere (and getting shot at whilst doing so, naturally), you’re stumbling around being massacred by beings which can see you long before you can see them. Corners. There could be anything concealed around there. Anything! Said anything typically comes armed with a gun and the time units to reaction fire at you. The only way to find out if there is an anything is to step out and look. Some corners don’t have a concealed anything. Most corners don’t. This makes it worse. Eventually you get so used to a big, safe nothing that when the plasma bolts fly it’s a “Nearly spilled my tea!” shock. Note: spilling tea across your desk impairs command ability. Don’t do it. There’s always that one guy. The one who cannot throw straight. The one who misses so badly that the alien is outside the blast radius. The one who ‘accidentally’ drops the live pineapple at the feet of his ‘favourite’ squadmate. The one who gets the grenade stuck on a roof somewhere instead of in front of the door. That guy. Explosions have relative power. When you get comfortable with the idea that a standard grenade will kill any alien it explodes near, the aliens get tougher. Lobersterman? Boom, it’s still alive. Boom, still alive. Boom, still alive!? So then you need to get better grenades. Then the cycle repeats itself. Aliens get grenades too. Their grenades are better than yours. Enough said? Who’d have guessed that carrying one rocket launcher, three rockets, a laser rifle, a plasma pistol, and a stun rod would slow a soldier down to the point where he can hardly drag his over-laden body along one square per turn? Lightning-fast, stacks of health, and a one-hit kill attack which turns your poor pixel-dude into a zombie. What’s not to hate? If a pixel-dude is killed by a Chryssalid, they will turn into a zombie. If a zombie is killed, it will turn into a new Chryssalid. Think that’s bad? Zombies used to be parts of your fire-team. That means they are nice and close to the surviving squaddies. Meaning chain-zombies. Chain-zombies! The name makes it sound like a Pokémon. Terror is lulling you into a false sense of security. This is Terror‘s version of the Chryssalid. Which means it’s the same thing but nastier. HELP!! Because sometimes there’s an alien there. Waiting. With a plasma gun. Sometimes there are two aliens. And they’re both Chryssalids. The on-death explosive radius is how big!? It’s like having a machine gun which fires miniature grenades. What could possibly go wrong? Shooting at close range. Shooting in a narrow space. Shooting down an alleyway and having a round go astray, clipping a nearby wall. Shooting anywhere vaguely near an ally. Shooting near something else which will explode, setting off a chain reaction. Shooting something which would have dropped cool loot if weren’t reduced to smouldering ashes. Pretty much anything involving shooting, really. The only thing worse would be not shooting, and getting over-run by slobbering Xenos scum! We understand that your organisation is struggling against a strange and overwhelming threat. We appreciate that you are under-funded, behind in research, and are barely keeping your head above water. We are aware that you have killed more aliens than any other organisation on the planet, and that it’s rare for a terror event to slip by your net. Regardless, we are withdrawing all funding from your organisation. We will still cry and generally spoil your life if you do not protect us. PS: Please send more of those snazzy laser guns. My kids love those things. We use them to provide light shows at party political rallies and prove that we’re down hip with the youth. I know you cats use them to zap aliens with and all, but needs of the state and all that. Smoke grenades provide a degree of cover from aliens. Little pixel-dudes slowly suffocate when standing in smoke (if they’re not wearing power armour). Stand where you are and smother your way to unconsciousness, or make a break for fresh air and get shot down? Decisions, decisions. Who ordered the lobster Thermidore? The game’s backstory is wrong. 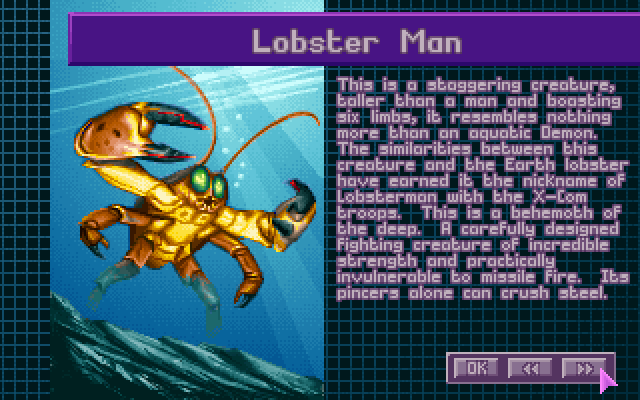 Lobstermen were in fact created by a well-meaning vegetarian militant-pacifist mad-scientist. True story! This gentle, vengeful soul walked past a fish restaurant one day and decided to put an end to the cruelty of live lobster boiling. Having considered solutions such as armed raids on places serving lobster, and attaching miniature gatling guns to the shell of each lobster, the fellow hit on the ideal solution: making lobsters immune to heat. He created a serum, and injected it into his first test subjects. The good news is that it worked: lobsters are now practically heat-proof. The bad news is that they mutated into 6 foot high, virtually indestructible, intelligent monsters with claws for hands, the ability to fire guns, and a certain sense of pique over the whole ‘consumed as a delicacy’ thing that their ancestors experienced. Taking an underwater gun to a land-battle. Fun fact: some of Terror‘s weapons only work underwater. Try to use one on land and the best you can hope for is that the aliens die laughing. What makes Terror‘s shipping missions so bad? Everything. Shipping missions are a microcosm of X-COM death causes. They feature the nastiest alien types. There’s about sixty-bajillion aliens on the map. They are packed full of doors to open and corners to look around. There’s scenery which blows up, typically packed into some small room to ensure the unlucky shooter is caught in the blast radius. There are civilians running about like idiots. As multi-level maps, there’s plenty of spots for aliens to snipe you. They’re land-based, so some of your weapons won’t work. And there’s two parts to each mission. Yes, that’s right. Survive the brutal first map, and your ‘reward’ is a second map which is just as difficult. You get no chance to replenish your stores or call in reinforcements, so you’ll be tackling that second map with whatever you have left from the first one. You can virtually guarantee that there will be aliens inside. To get inside you have to open doors. Then, corridors. Lots of corridors. Those corridors have more doors. Also blind spots. Stray shots will trash computer systems and other Mysterious Alien Gubbins. If you are lucky nothing will explode and kill your pixel-dudes. Terry Pratchett wrote in one of his Discworld books that million to one chances happen nine times out of ten. I reckon he played X-COM. After years of saving her pay and hazard bonuses, Geraldine bought the farm planning for a quiet retirement. Then a UFO landed and she bought the farm in different sense. Once upon a time, the Sphinx baffled travellers with a riddle about legs, time, and … stuff. Anyone failing to answer correctly got eaten. Thanks to some blabbermouth everyone but everyone knows the answer is “Man”. So the Sphinx changed questions. Nowadays she asks about X-COM games. 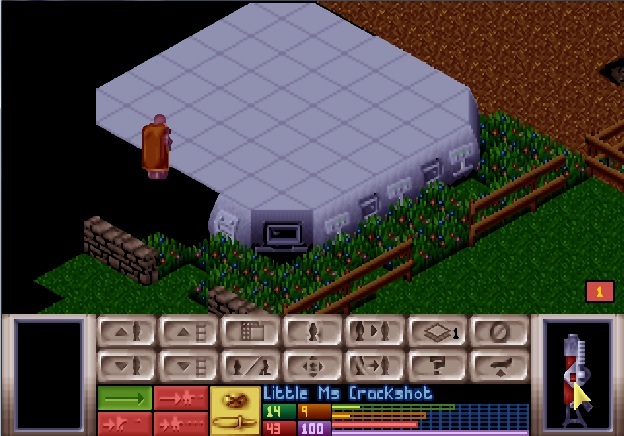 UFO, X-COM, or XCOM? Which Enemy Unknown is which? Is XCOM a single forthcoming game, or a series? And what about those UFO: After[word] look-alike games? Many travellers have since been devoured. Next time you play, ponder this question. Then watch the death-toll spiral as little pixel-dudes pay the price of your inattention. Using the starting base layout. The Gollop brothers decided to teach the player about building a good base by giving them a horrific death-trap of a design to start out with. If you are fool enough to use the default layout you will find aliens spawning from all directions, and running about with nothing to funnel them in predictable routes. This is bad because there will be rather a lot of them. Aliens here. Aliens there. Aliens everywhere. Your cup shall runneth over with aliens. Base defence missions. Full stop. Like double glazing salesmen, aliens always pick the worst possible time to ring the doorbell. How do you feel about entering a tough battle with the bunch of rookies you left at home to feed the cat whilst your real team’s off killing aliens? Not to forget the equipment bug which means you do not get access to your best weapons – or indeed any weapons – if your base’s stores are too full. Too full is defined as more than 80 items. Grenades and ammo clips are counted individually. The game chooses which items to give you; you don’t get to choose from a list. Forgot to keep your stores clean and tidy by selling off everything you do not need on a regular basis? Please enjoy defending your base with 40 plasma clips, 20 flares, 19 smoke grenades, and that pistol you forgot to sell at the beginning of the game. The Great Space War, aka Interceptor, features a lot of this. Whether caused by missiles, plasma blasts, lasers, collisions, mind control, or other factors, death in space always came down to this one understated line. Damn those exploding starfighters! Sometimes it’s hard to think of a good name. Sometimes those operatives go on to become legends. All hail Sausage, alien slayer extraordinaire! 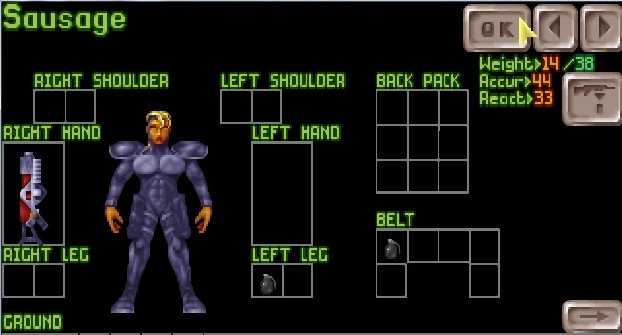 The X-COM 1 difficulty bug. 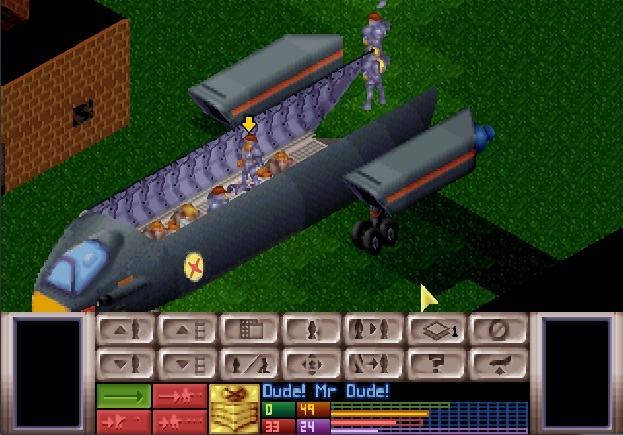 The original X-COM shipped with a bug that caused its difficulty level to reset to beginner after the first mission. Unsurprisingly, many players found the game far too easy. The development team for Terror from the Deep heard their cries, and upped the difficulty in the sequel. Terror is hard. It’s harder than bricks. It’s harder than your best friend’s pro-wrestler Dad. It’s harder than Arnie. Terror‘s difficulty is responsible for countless little pixelated, bubbly deaths. Previous Previous post: Highlights from the EB Games Expo Sydney 2012: The Last of Us, Tomb Raider, Wii U, Australian indies and more!